Gods Gift is a dank hybrid with indica dominant characteristics. The nugs are very dense and colorful. The densisty seemed to make the bud last longer in the vape, even after the nugs were broken up. 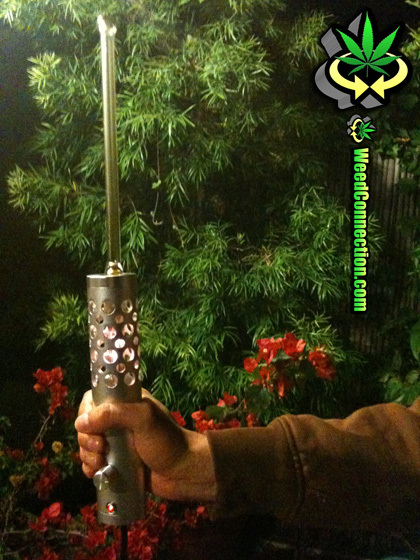 The Life Saber Vaporizer one of the best vaporizers ever. It is what they call a social vaporizer. It heats up quick and it is easy to pack multiple bowls. There is a long power cord, which simplifies the task of passing it around. This device is called the Life Saber because it looks like a light saber from Star Wars. You truly feel like a Jedi Master Kush the first couple of times you blaze out of it. Get this Vape @ Head Change Distributors. Mention Weed Connection referred you and they will give you a 15% discount. May the force be with you.